Like millions of Americans, Mark Leibovich has spent more of his life tuned into pro football than he'd care to admit. Being a lifelong New England Patriots fan meant growing up on a steady diet of lovable loserdom. That is, until the Tom Brady/Bill Belichick era made the Pats the most ruthlessly efficient and polarizing sports dynasty of the modern NFL, and its fans the most irritating in all of Pigskin America. Leibovich kept his obsession quiet, making a nice career for himself covering that other playground for rich and overgrown children, American politics. Still, every now and then Leibovich would reach out to Tom Brady to gauge his willingness to subject himself to a profile. He figured that the chances of Brady agreeing were a Hail Mary at best, but Brady returned Mark's call in summer 2014 and kept on returning his calls through epic Patriots Super Bowl victory and defeat, and a scandal involving Brady--Deflategate--whose grip on sports media was as profound as its true significance was ridiculous. So began a four-year odyssey that took Mark Leibovich deeper inside the NFL than anyone has gone before. From the owners' meeting to the draft to the sidelines of crucial games, he takes in the show at the elbow of everyone from Brady to big-name owners to the cordially despised NFL Commissioner, Roger Goodell. 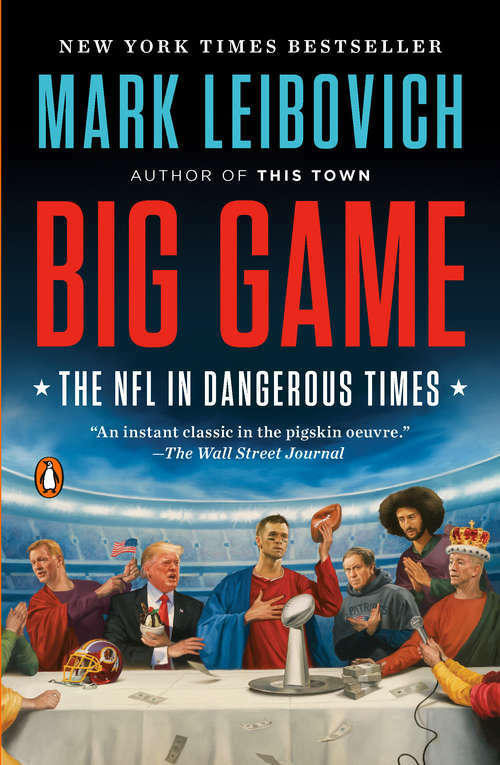 Ultimately, BIG GAME is a chronicle of "peak football"--the high point of the sport's economic success and cultural dominance, but also the time when the dark side began to show. It is an era of explosive revenue growth, but also one of creeping existential fear. Players have long joked that NFL stands for "not for long," but as the true impact of concussions becomes inescapable background noise, it's increasingly difficult to enjoy the simple glory of football without the buzz-kill of its obvious consequences. And that was before Donald Trump. In 2016, Mark's day job caught up with him, and the NFL slammed headlong into America's culture wars. BIG GAME is a journey through an epic storm. Through it all, Leibovich always keeps one eye on Tom Brady and his beloved Patriots, through to the 2018 Super Bowl. Pro football, this hilarious and enthralling book proves, may not be the sport America needs, but it is most definitely the sport we deserve.